Abstract: A vessel rotation is a sequence in which a vessel visits the different terminals in a large port for loading and unloading containers. Constructing a vessel rotation involves making a lot of appointments through communication. Nowadays, the communication between vessel operator and terminal operator is done through telephone, fax, and email, based on the operator's knowledge and experience. 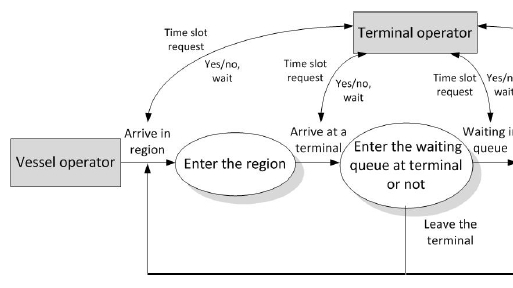 With this practice, it happens frequently that appointments cannot be met either by the vessel operator or by the terminal operator. In this paper we propose a technique to solve the vessel rotation planning problem in an automated way. For this, we propose to model the problem as a distributed constraint optimization problem (DCOP). DCOP has generated much interest in the artificial intelligence and constraint programming communities, and a number of algorithms have been developed for solving DCOPs. However, DCOP algorithms have been rarely used in practice. This paper presents a first approach based on DCOP for generating reasonable and optimized rotation plans for vessel operators. To evaluate the performance of the proposed approach, diffrent DCOP algorithms are considered. We evaluate the solution quality and computational and communication costs of these algorithms when solving the vessel rotation planning problem. Reference: S. Li, R.R. Negenborn, G. Lodewijks. A distributed constraint optimization approach for vessel rotation planning. In Proceedings of the 5th International Conference on Computational Logistics (ICCL'14), Valparaiso, Chile, pp. 61-80, September 2014.